These wavy-haired dogs make the perfect companions, both on the couch and on the hunt. Learn more about the smallest dogs in the sporting class. 1. THERE ARE TWO DIFFERENT KINDS. Although they look similar, English and American cocker spaniels are recognized by the American Kennel Club as two separate breeds. In the 19th century, American and English breeders began to focus on different traits. American cocker spaniels tend to be smaller, with rounder heads; English cockers have less distinct eyebrows and longer snouts. Eventually, the two dogs were different enough to warrant a separation of the breed in 1945. 2. THEY WERE BRED TO HUNT. As the name suggests, spaniels come from Spain. They were bred as early as the 1400s as hunting dogs. The large family of dogs included a wide array of different shapes and colors, all boasting different qualities to help hunters in the field. Spaniels were eventually broken up into land and water categories, with cocker spaniels becoming used mostly for land hunts. 3. THEY’RE CLOSELY RELATED TO SPRINGERS. Originally, one litter of land spaniels could yield both cocker spaniel and springer spaniels. The smaller dogs were cocker spaniels, because they were tasked with hunting down woodcocks, a type of bird that flies low to the ground. Larger dogs were called springers because of their ability to spring into bushes and scare flying birds out of hiding. The two types were officially considered different breeds in 1892 by the English Kennel Club's stud book. When Paul Sperry watched his cocker spaniel, Prince, running on ice without a problem, he wondered how it is that dog paws have such great traction. Upon closer inspection, he noticed Prince's paw pads had wave-like grooves. This texture inspired his 1935 patent for a sole featuring what he dubbed "Razor-Siping." Sperry's Top-Siders were the first boat shoes, boasting great traction and white soles that didn’t mark up the boat. Today, Sperrys can be found on and off the boat, in a number of different styles (sadly, the company hasn't yet expanded into Sperrys for dogs, though). Arguably the most famous cocker spaniel: Lady, from 1955's Lady and the Tramp. The breed’s silky hair and prim disposition made the dog the natural choice for the elegant lead character. Another famous cocker spaniel can be spotted tugging on a certain bathing suit on bottles of Coppertone suntan lotion. 6. THEY'RE BELOVED BY PRESIDENTS AND CELEBRITIES. Thanks to their gentle personalities and friendly attitudes, cocker spaniels have long been a favorite among the rich and famous. Actor George Clooney has an elderly cocker spaniel named Einstein that he rescued from a California animal shelter. Duchess Kate’s younger brother gave her a cocker spaniel named Lupo as a wedding present. David and Victoria Beckham brought home a cocker spaniel named Olive in September, and Oprah once had one named Solomon. The lovable breed isn’t just limited to the celebrity life—there have been some in the White House as well. Presidents Truman and Nixon both had cockers named Feller and Checkers respectively. 7. THEY PEAKED IN POPULARITY IN THE 1950S. Back in the ‘30s through ‘50s, cocker spaniels were the most popular dog in the country. Their popularity dipped, but the pups had a second brief stint at the top in the ‘80s. Today, the breed is the 30th most popular registered breed in the United States. 8. ONE CAME OVER ON THE MAYFLOWER. Spaniels first came to the United States in 1620 on the Mayflower. 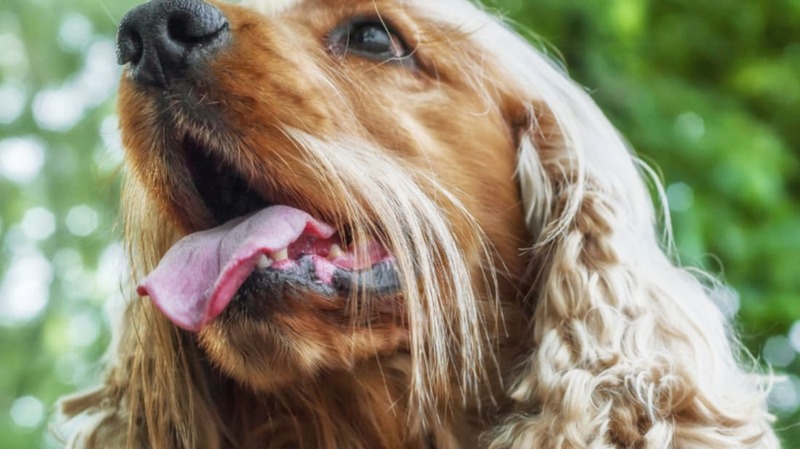 The first official cocker spaniel registered by the AKC was Captain, a white-and-liver colored dog that was recognized in 1878. Cocker spaniels are naturally mushballs, so don’t expect them to protect your house. Any intruder is likely to be met with enthusiastic affection and a tail wag. 10. … BUT THEY’RE SMART. Cocker spaniels are capable of accomplishing all sorts of impressive feats. Take, for example, Fudge the cocker spaniel, who graduated from the Edinburgh Napier University in matching robes as his owner. Another cocker named Ginger took a Gaelic class with her owner and mastered basic commands in the language in only three weeks; the 4-year-old pooch could suidh (sit) and fuirich (stay) like a native listener. Still not impressed? Bella Boo can do over 250 tricks, including amazing balancing acts with treats.